The 2011 World Championship of Public Speaking, hosted by Toastmasters International in Las Vegas, Nevada, is now history. Congratulations to all contestants, especially Jock Elliott (1st Place), Kwong Yue Yang (2nd Place) and Scott Pritchard (3rd Place). I must, however, say a special word about my friend, Olivia Schofield, who also participated in finals. She represented District 59, which comprises 18 countries in Continental Europe. Olivia gave a terrific speech about her efforts to overcome a speech impediment when she was younger. It was poignant, funny, moving and inspirational. Her message? Don’t let your limitations make you believe that you are a failure. The speech left people in tears and cheering. In fact, the only thing wrong with Olivia’s speech … was that it ran 15 seconds overtime and she was disqualified! That’s a tough pill to swallow. I know that I am biased, but I am certain that had she not gone overtime, Olivia would have been on the podium and may well have won the contest. I hasten to add that nothing is to be taken away from Jock, Kwong and Scott. They each gave a fantastic speech. And they stayed within time, which is critical. They won fair and square and are to be warmly congratulated. Indeed, Jock deserves special recognition. He has competed in Toastmasters speech competitions for over 20 years, made it to the Finals five times before this year, and finished third in 1994. In fact, in 1993, Jock (like Olivia this year) was disqualified for going over time. Talk about passion and persistence! Jock is an example for us all when it comes to both public speaking and not giving up on your dreams. I had a long chat with Olivia last night on Skype. The main thing we talked about was the terrific response she got from people who came up to tell her how much her speech meant to them. We also talked about what she learned from this experience, what the future might hold for her and how she could continue to share her message with others. There was little time for regret. And therein lies another lesson for public speakers. If you are going to speak in public, you are going to have setbacks. Whether it’s going overtime in a speech competition, forgetting a key point, having your equipment fail without a back-up plan, losing your audience’s interest, or any one of a thousand other things, you are going to have your share of bad days. That’s part of the deal. The key is how you handle the experience, what you learn from it and what you do going forward. 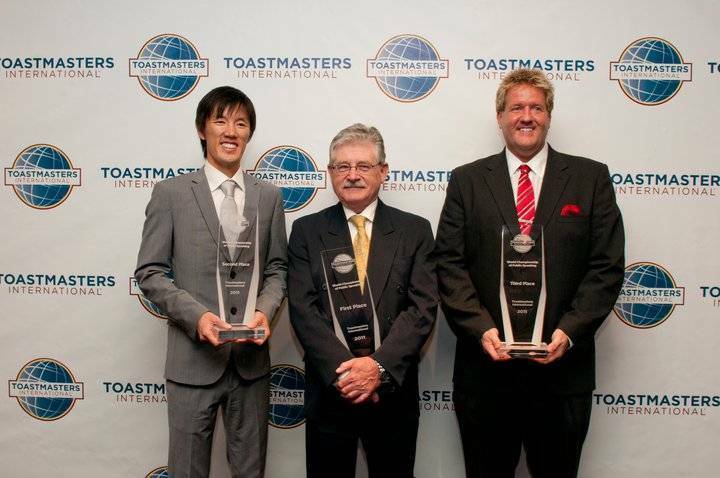 Again, my sincere congratulations to all contestants in the 2011 Toastmasters World Championship of Public Speaking. This entry was posted in Speech Contests, Toastmasters and tagged International Speech Contest, Jock Elliott, Kwong Yue Yang, Olivia Schofield, public speaking, Scott Pritchard, Toastmasters International. Bookmark the permalink. I didn’t attend in 2011 but had a fellow member purchase the video DVD and I watch it regularly. During speech marathon season, I watch the entire video of 10 contestants and always observe something new from their presentation. Despite who takes 1st, 2nd & 3rd, I find I have my own favorites. During our Division competition, I always time the contestants and make notes on how their speech develops compared to the time. If a contestant hits 7:15, I myself panic for them. Thanks for the comment, Terry. If you watched the 2011 finals, you would have seen my dear friend, Olivia Schofield perform. I watched the competition live on the Internet and was also timing. I know exactly what you mean about panicking at 7:15. Unfortunately, she went way over time and was disqualified. But it’s all part of deal, isn’t it? Thank you for your post and for taking the time to interview Olivia. I was a semi-finalist last year and had the great honor to see Olivia’s speech live. I thought she nailed it. My friend and I were heartbroken when we realized she went over time. We still talk about her to this day. I recently went a few seconds over time in a humorous speech contest, and it made me think about her again. After practicing, practicing, practicing – it’s just amazing the things that can change in front of different audiences. I hope she doesn’t give up – I won’t! One of us has to win another Championship for the girls. Melanie, you’re right, no one knows what it’s like to be up there till you are up there on that stage in front of that audience. I am now giving keynotes and workshops at districts all over America sharing my story. I am living my dream. Keep competing, keep growing and remember the Award is not the Reward. Thanks for the message, Mélanie and congratulations on your performances. Yes, it was tough to watch Olivia go over by 15 seconds, but that’s life. And she handled it like a champ. I am in regular touch with Olivia by email and Skype and have recently caught up with her in Poznan, Poland and Berlin, Germany. Same old Olivia! She and I will be speaking together at an event in Bonn, Germany this November. All the best with your speeches. I hope that our paths cross one day at a TM event. Olivia’s story got a whole new meaning to me yesterday, as I watched my younger sister perform on stage in Humorous Speeches contest in German. She was an absolute super star, the competitors would just have to bite the dust if her amazing speech hadn’t been 3 seconds too long. I am going to send her the link to this article right away so she can be inspired by Olivia’s example in handling the disappointment. Thanks for posting it, John! I couldn’t have said it better to her. Thanks for sharing, Katarina. It’s a shame that Veronika went overtime by a few seconds, but it happens. If she is as good and determined as you, I have no doubt that she will be back, stronger than ever, next year. There is always another contest season just around the corner. Tell you sister that the disappointment that she feels now will soon start to fade. Before she knows it, it won’t bother her at all and that is when she will be able to take a hard, “clinical” look at her performance and figure out what she needs to do so as not to make the same error again. Tell her that I have no doubt that, in the long run, this will turn out to be a positive learning experience for her. I agree with your analysis of Olivia’s speech. While all finalist speeches were stellar, Olivia’s was the most moving and inspirational. In fact, her speech made me get my first ever teddy bear & I have named it Wowick. This was my first international conference and it was an amazing experience. I could not believe there are so many people who have been attending for 12, 20 even 28 years! Thank you for the comment, Bina. I am glad that you had a great time. I have yet to attend an International Conference and look forward to doing so. I will be sure to pass on your message to Olivia. Thank you for the comment. I’m so glad you liked my speech about Rodrick (Wodwick). Why not put a picture of your new bear on Facebook? I’d love to see it! Hello John, I had a quick try but could not find the speeches of the championship on the web, youtube. Do you have an idea? I can only imagine the disappointment. I lost an Area contest by one second. Olivia is to be commended for her grace. I wish I’d heard the speech! And what a speech it was. Rich, thanks for the comment. You won’t be disappointed. Concerning Jock, I took the stats from his website (the link on his name in the middle of my post). It says that he competed four times, so I went with that. But I hesitate to call you on TM trivia … I’ll dig a bit more and see what I find. Very important message you have here John. It is SO easy to put one’s attention on losses and forget the wins in life. Thanks again for such an interesting post. By the way, the link to Jock has http twice and doesn’t open because of that. I appreciate the comment. Thanks also for the heads up about the link. It is fixed now. PS – Really like your website John… clear and concise, classy, stylish, informative and quirky – with a dash of inspiration… not unlike your speaking!! Thanks again, Michael. I really appreciate the comments. “Informative and quirky” – I love it. I just might have to work it into a new tag line! It’s a shame that in this far too competitive world of ours – pressured I believe by an ingrained drive for ‘winning’ that many (especially Americans) have championed – we often lose sight of the reward that pitting oneself against one’s own limitations and fears offers us. I suspect that the gain in hard-won experience and lesson in grace that Olivia has/will experience due to those ’15 seconds’, will, in many ways, outlive the disappointment of not ‘winning’…whatever happens she won the greatest reward of all…personal growth. What a great comment, Michael. Thanks very much for reminding us about the importance of maintaining a proper perspective of things. Thanks for sharing the text. Regret I haven’t seen Olivia in Lisbon, but there will be other opportunities. It’s really disappointing to be out by time limits, because you get the feeeling that you never know the real result if you’re in time, but rules are rules. I remember watching an educational speech by Lance Miller in Lisbon (2009), before the Dusseldorf convention, and he mentioned to have lost a contest by 1 second at his Toastmasters club!!! The message I’ll never forget is that “if you don’t control the time, you don’t control the speech”. Easy to say, not so easy to implement. Glad Olivia reacted positively. Muito obrigado, Nuno. I like the saying by Lance Miller about controlling time; thanks for sharing it! Olivia is very positive about the competition and I am sure that you will have other opportunities to see her in District 59. Nevertheless it’s an experience she will never forget, and as Jock proves this is not the end! Hi Willem, thanks for the message. The official time for the speech is 5 to 7 minutes. The red light goes on at 7 minutes and that means you have an extra 30 seconds to conclude. Olivia went 15 seconds beyond the 30-second buffer. But you are right – this is definitely not the end for her.